About 6 months ago I created a little corner of mom space in my kitchen. And I mean little. I had tried the morning room desk. I’d tried a desk in the guest room. I’d tried a drawer in my nightstand. I’d even tried a portable file basket. Well, where do we find ourselves seemingly half the day? The kitchen. Yep, if you are like me, that’s just where you land. So I finally decided to create for myself a little corner, for mom only. I am proud to announce that 6 months later this little mom space in my little corner of the world is going strong and helping me keep it all together! As are so many things in life that end up actually working, it is simple. But the simplicity of it has helped me keep life a little simpler. I started with a mail sorting box. A simple wooden one I had purchased at Target a few years back. You can still find them at Hobby Lobby, Container Store, Kirkland’s, etc… I hot glued to the front a little wooden phrase to keep me inspired. There are two smaller slots in the front, meant for envelopes. 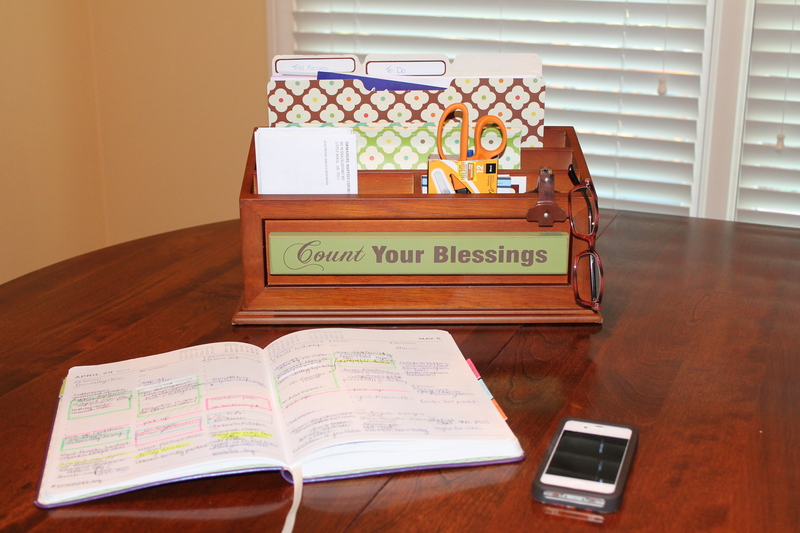 I use one to keep our church offering envelopes and a pad of sticky notes. In the other I keep a box of pens/scissors, labels, and calendar stickers. Behind these two slots are two letter sized divided sections. In the first I keep two notebooks. One holds complete weekly menu plans with shopping lists, and for now the other is just a spare, empty notebook. If I decide the menu plans are keepers I transfer them to the computer. 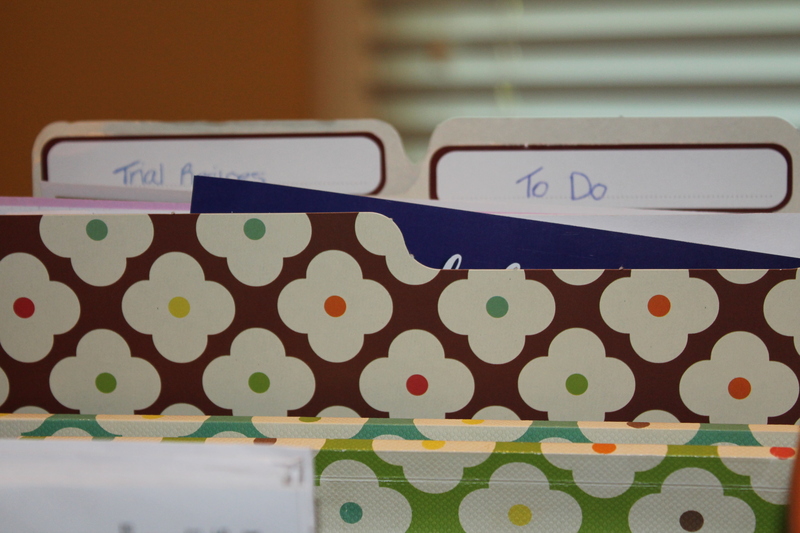 The second section holds simple, decorative letter size folders. The first one is “To Do”. The only things I put in here are school papers to be signed within the next week, upcoming appointment information if it doesn’t belong in one of my project notebooks or can’t be transferred to my iPhone calendar. The second folder is for recipes I’d like to try. I have found I am more apt to try things off of Pinterest etc… if I print the recipe off and place it here. 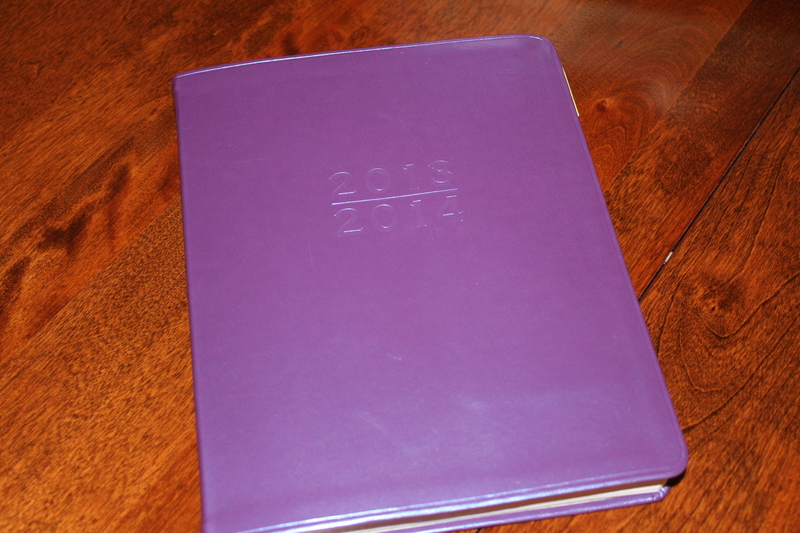 Then I have a folder for Blog Ideas and one for Home Ideas (current projects). That’s it. Simple, simple, simple. Notice I do not have a “To File” or “To Pay” folder. I have found those just don’t work. If it needs to be filed I try to do that immediately. If I don’t get that done, then it simply goes in the “To Do” folder, which I check each morning and evening. I rarely lose anything, I am staying on top of things better and if it doesn’t fit one of these folders I really have to question if I need it. Of course, none of this would work without my great weekly calendar. I love the calendars they carry at Barnes & Noble. Pretty colors, simple design, and plenty of writing space for each day. I keep my monthly calendar on the iPhone-which of course I make certain is a part of “the Cloud” and shared with family. The weekly calendar is where I assign tasks to days and specific times. I have learned over the years to keep white space on my calendar. White space is used in marketing and publishing. There is evidence that without white space on a page, your eye can’t determine where to rest and information is taken in all at once, jumbling the images and messages. I have found without “white space” in my calendar the same thing happens! Appointments or tasks run together, I become distracted or fractured and accomplish less. The “white space” acts as time buffer between appointments or tasks. It gives me a little breathing room. I am calmer, things actually get completed and my brain can rest and refocus as I transition from one thing to the next. In the back I have mounted a small project planning pad. Each current project has a title page. I can keep track of tasks for each project, take notes and document communications etc… I make certain some task for each project is on the weekly calendar page. I hope my little corner of the world and its supplies will encourage you to find your own corner of the world. When you are coming down on yourself for NOT keeping it all together, stop, breathe and pull together some pretty supplies and create your corner of the world. You deserve it.